If you have one week to spend in Oaxaca, here is a possible itinerary which would allow you to see the best of what the city and surroundings has to offer. This itinerary runs from Saturday through Sunday, but if your trip runs different days, let us know: we’re happy to adapt an itinerary to your schedule and interests. Start your week in Oaxaca with a walking tour of the historical city center to learn about the history of the city, its architecture, and local customs. Oaxaca is a UNESCO World Heritage city and it has many beautiful colonial buildings that attest to its rich history. We will begin at Santo Domingo church, the best example of Mexican Baroque architecture, then stroll along some of the picturesque streets as we visit Oaxaca’s most outstanding landmarks. We’ll visit the Benito Juarez and 20 de Noviembre markets, and stop at a chocolate factory to see the process of grinding cocoa beans to make Oaxacan chocolate. Heading east from Oaxaca city, we will visit a few villages in the Tlacolula valley. Santa Maria el Tule is home to a huge tree which is over 2000 years old – it’s one of the oldest trees in the world, and is the tree with the greatest girth. Teotitlan del Valle, a weaving village, is world renowned for the use of natural dyes, especially the cochineal (a parasite of the prickly pear plant). You’ll meet a family of weavers and learn about the traditional dyeing and weaving processes. Sunday is market day in Tlacolula – this is one of the largest weekly markets and people come from surrounding villages to sell their wares. After visiting the market we’ll continue on to Oaxaca’s second most important archaeological site, Mitla, which is well-known for its mosaic fretworks composed of thousands of individual pieces of stone to create geometrical patterns without the use of mortar. We’ll stop at a mezcal distillery where you can learn about the process for making this local beverage, and sample some. The Northern Sierra region of Oaxaca is rich in flora and fauna. We’ll drive up into the mountains northeast of Oaxaca city to a small village at an elevation of 3,180 meters (over 10,000 feet). Bring a sweater, because the climate is cooler and more humid here than in the dry and hot central valleys. Hiking through the cloud forest is an unforgettable experience, where you can discover a range of unique and diverse ecosystems. You will learn about the medicinal properties and uses of various local plants, and if you enjoy bird watching, you will be delighted here. We’ll enjoy some of the local fare at the village dining hall, enjoy beautiful scenery, and learn about life in rural Oaxaca. First we’ll visit Monte Albán, the ancient capital of Zapotec civilization, with its impressive monumental architecture. This was one of the first urban centers of Mesoamerica, built on a mountaintop 500 meters above the Oaxaca valley, offering beautiful views of the valley below. During this tour you will learn about ancient Zapotec civilization and its advances in mathematics, astronomy, medicine and architecture. After our visit to Monte Albán, we’ll continue on to Cuilapan, where we’ll visit an unfinished Dominican monastery of impressive proportions that today houses a museum and church in use by the local community. Afterwards, we’ll continue on to Zaachila. This was the last Zapotec kingdom before the Spanish presence in Oaxaca. The small archaeological site has two tombs with interior stucco work which are open to the public. Free day in Oaxaca City – optional activities include a cooking class or temazcal (traditional steam bath). Let us know in advance and we’ll be happy to make the arrangements for you. A trip to the Upper Mixteca region offers the possibility of visiting three 16th Century Dominican monasteries and churches with several original altars and paintings. 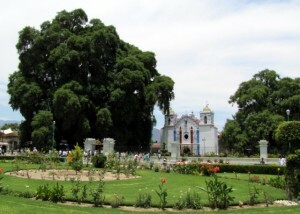 We will visit the recently renovated church and monastery in Yanhuitlan, then continue to Teposcolula and Coixtlahuaca. Each of the monasteries houses a small museum in which you can see paintings and carvings that originally decorated the churches. Besides their massive architectural scale, the churches still have their original tracery vault. Our first stop is the village of San Bartolo Coyotepec, famous for its tradition of making black pottery in a technique preserved through generations. Then we’ll continue on to the village of San Martin Tilcajete to visit wood carvers who create spectacular carvings in the shape of animals and mythical creatures. 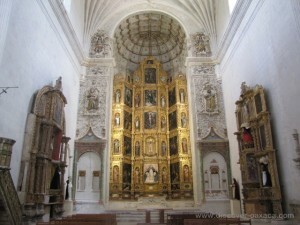 Then we’ll make a stop in Santo Tomas Jalieza. The women of this village weave using the prehispanic backstrap loom to make placemats, table runners, handbags and belts. Our next stop is the city of Ocotlán, hometown of Oaxacan painter Rodolfo Morales. Visit his house-museum, and the church and ex-convent restored by the Rodolfo Morales Cultural Foundation, which is now home to a museum of religious and folk art. Visit the workshops of the Aguilar sisters, folk art masters specializing in miniature figures that reflect rural life in Oaxaca, nativity scenes, the tree of life, market women, as well as Frida Kahlo replicas. If you plan this tour for a Friday, market day in Ocotlan, you’ll be able to visit the market which fills up the streets adjoining the central plaza. Contact us for pricing for this or any of our tours in Oaxaca.